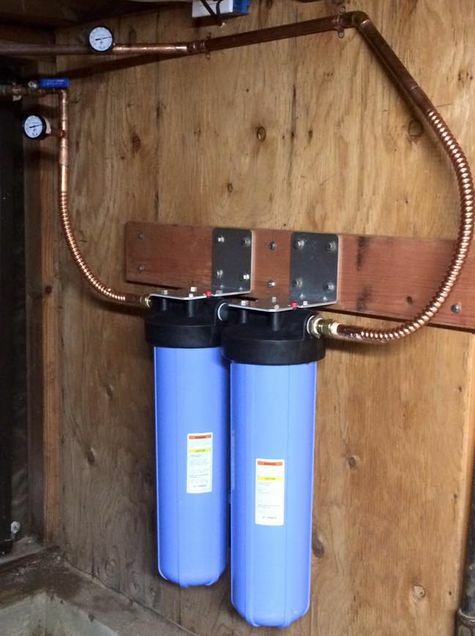 Compact Whole House Filters Installed in Series. Water passes through the sediment filter and then through the carbon block filter. An extremely versatile product, Pure Water Products’ Compact Whole House Filters can be installed in series, as shown above, or in parallel, as shown in the picture below. Parallel Installation gives double the flow rate potential. 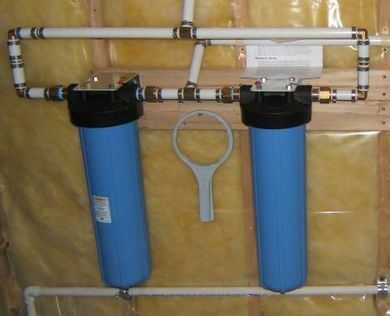 Two cartridges capable of handling 7 gallons-per-minute each become a 14 gallon-per-minute filter when the water line is split so that each filter handles half the flow. As the pictures show, even our multi-filter systems are sold for mounting on single brackets. This is a great advantage for the installer. The flow can be directed either right to left or left to right, the bracket can be pointed up or down, and multiple units can even be installed in separate locations, when space is tight. The filters can also be installed either in series (first picture) or in parallel (second picture). 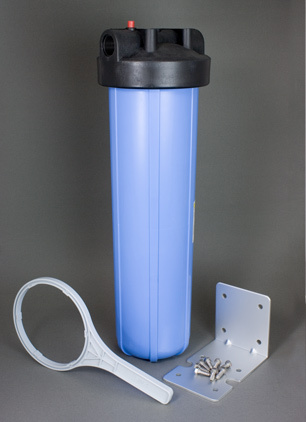 The “20 inch Big Blue” housing accepts 4.5″ X 20″ cartridges, a standard size, so many filtration options are available. The housing works with radial flow cartridges, where water flows from the outside of the cartridge to the center (carbon block and sediment filters) or axial flow cartridges, where water flows the full length of the cartridge from bottom to top (“media” cartridges with granular carbon, iron removal media, KDF, softening resin, pH amenders, etc.). 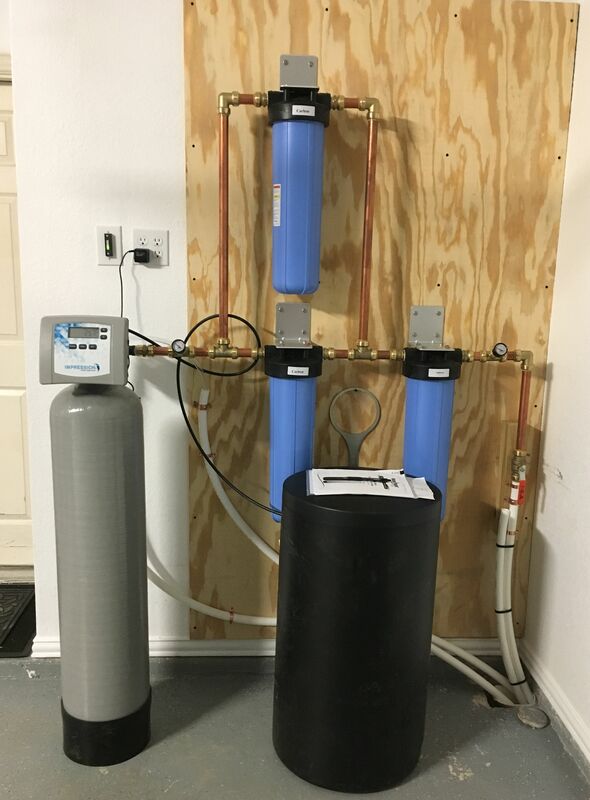 The Pure Water Products Compact Whole House Filter comes with housing, one filter cartridge, mounting bracket with screws, and a filter wrench for cartridge replacement. Typical applications of this filter are for whole house city water treatment of sediment, chlorine, chloramines, taste/odor, and extraneous chemicals, or well water treatment of sediment, low pH, iron, manganese, odors, and scaling. Compact units are easy to install, needing no drain or electrical connection, inexpensive, and versatile. The standard pipe size is 1″, but they are available also in 3/4″ and 1.5″ sizes. Cartridges that will fit our Compact Whole House systems.